WASHINGTON — To break Democrats’ insistence on parity between defense and non-defense spending increases, Senate Majority Leader Mitch McConnell, R-Ky., is arguing defense spending has been hit harder. The messaging comes as Democratic and GOP leadership, and the White House, are locked in complicated negotiations to land an overdue federal budget for 2018 and avert a government shutdown. “Since fiscal year 2013, discretionary defense spending has been cut by $85 billion more — $85 billion more than nondefense spending. That number has real consequences for the men and women who serve our country in harm’s way,” he said. Democrats are fighting McConnell on the $85 billion data point, arguing that GOP math selectively cites discretionary spending cuts and ignores cuts to mandatory spending. The 2011 Budget Control Act also slashed mandatory non-defense programs by $17 billion a year since 2013, primarily from Medicare, according to a Democratic aide. McConnell also ignored the increases to wartime overseas contingency operations, or OCO, funding, which is exempt from caps and “received tens and tens of billions of dollars,” Sanders said during a floor speech Thursday. “If you include the overseas contingency operations funding, the reality is that overall defense spending has gone up, not down, over this time period while non-defense discretionary spending has been severely cut,” he said. The Senate majority leader has also highlighted the U.S. military leadership’s warnings of a readiness crisis and eroding technological edge. According to defense budget analyst Todd Harrison of the Center for Strategic and International Studies, Sanders was right that more has been added to defense through OCO than domestic spending. Harrison was also dubious of the $85 billion figure. Beyond the budget numbers, hot-button issues are part of the talks. Senate Minority Leader Chuck Schumer, D-N.Y., is insisting the spending package include disaster aid, a health care package and protections for young undocumented immigrants. Congressional leaders this week have been in closed-door talks with Trump administration officials. With the clock ticking toward Jan. 19, when the latest stopgap spending bill runs out, they had yet to announce any breakthroughs, as of Thursday. The “big four” leaders — McConnell, Schumer, House Speaker Paul Ryan, R-Wis., and House Minority Leader Nancy Pelosi, D-Calif. — have been in meetings with the White House’s budget director Mick Mulvaney and legislative director Mark Short. 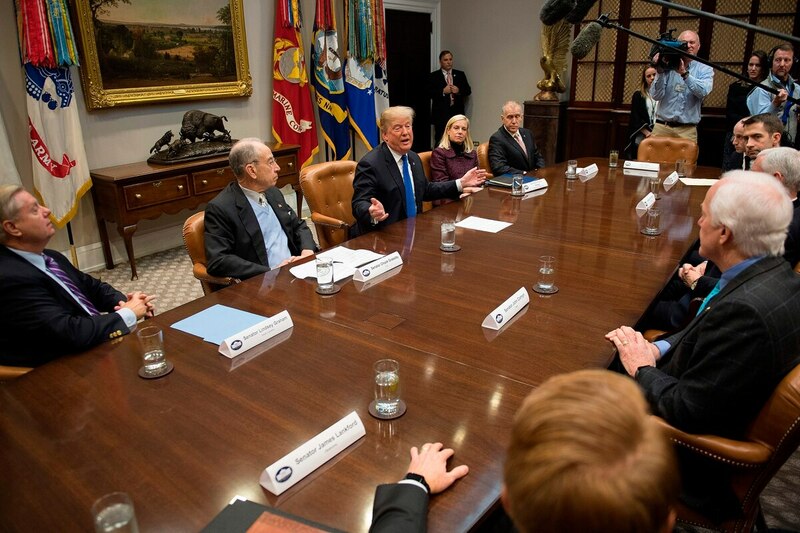 A group of Republican lawmakers also went to the White House Thursday to gauge what President Trump would accept as part of a deal on the Deferred Action for Childhood Arrivals program, which shields immigrants who came to the U.S. as children. The White House and Republican hardliners have called for more restrictive immigration policies — and a wall along the U.S.-Mexico border, if not border security funding. The Senate’s No. 2 Republican, Sen. John Cornyn, of Texas, earlier in the week, sought to tamp down expectations from within his own party, saying the more additions, the harder it will be to get consensus.